Philosophy is written, practiced, lived through: it is the translation of the experience of a thinking subjectivity in a conceptual alphabet and a verbal fabric. The I of philosophy is a chimera whose head tickles the heights of abstract concepts and universal discourses, while its body is grounded in the lived experience. At the hinge between these two realms called for by the speculative effort, stands the verbal material. Its meaning can only be determined taking into account its relationship to its contexts, the writing and reading practices surrounding it, the horizons of significations and even the implicit polemical charge which characterizes every philosophical contention. Likewise, the specificity of each theoretical expression is both the sine qua non condition for the perpetuation of a discipline looking to evolve and transcend its own categories, and the most subjective and personal aspect of a work that traditionally aims at the “neutrality” of abstraction. The “making of a philosophical text”, including its cultural features and societal contingencies, challenges the representation of the discipline’s history as a series of abstract findings and innovative intuitions that constitute the landmarks of our paradigms. The philosopher who writes is the first inclined to erase the complex intricacies of the negotiations between existence and theory, between conceptual inventiveness and shared vocabulary inherited from a centuries-old tradition. Yet it is obvious that the dynamics of philosophy production and reception are a complex phenomenon whose writing nature is a crucial stake. As reminded by Derrida reading Paul Valéry, such dimension of the philosopher’s work is constantly and almost physiologically overlooked in the representations of the discipline’s aims. Strong borders seem to delimitate fields renowned to be dissimilar, if not incompatible: philosophy and literature are therefore often seen as rival siblings, and their respective horizons do not take easily into account some elements that turn out to be indispensable to understand—from a dynamic, historical-cultural point of view—the production of theoretical prose. Likewise, and opposite to the tradition of the Romantic period for instance, intellectual work rarely binds philology and philosophy. 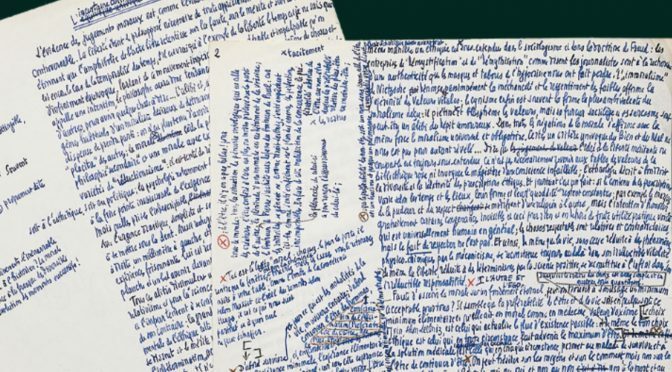 For all these reasons, the philosophical manuscript is an odd object that has only recently started to receive proper appraisal. In Europe nevertheless, the creation of archive centers gathering major philosophical data—such as Nietzsche, W. Benjamin or Kierkegaard—has sustained the memory of philosophical writing and enabled such “arches” to cross time waiting for the moment when, partly thanks to the development of digital humanities, these materials could get a much deserved attention. Thanks to the editing of philosophical manuscripts, the information contained by such media beyond the text itself turns out to be manyfold. The ontology that vitalizes and structures the hermeneutical gesture behind the work on manuscripts is indeed different. Such perspective enables to look at the evolution of a theoretical thought as a living and specific adventure, and the history of the discipline a dynamic, manifold and choral process. Still, not all the documents, as dispersed and little known traces of the philosophical practices, can be turned into books and remain hidden to the public eye. But it is beyond doubt that accessing these archives often enables to better understand the appearance, the method, the approach and even the sources, along with the polemical targets and the hints that published books tend to excise or dim. Often only the specialists working on the critical edition of the works of a thinker-writer, or the archivists in charge of a fund are able to develop knowledge from such materials: working on archives demands time, and it does not match the rhythms imposed today to research and intellectual production. Therefore creativity expressed by researchers as they come up with ad hoc tools to publish or interpret a set of manuscripts has not yet been subjected to a comparative approach aiming at setting common methodological principles. If genetic criticism has developed since the 1970s an important set of tools and philological methodology specific to the study of writers’ manuscripts, little has been done to elaborate guidelines when dealing with philosophical archives. This conference aims at establishing a dialogue between specialists from various countries and continents who have worked on different corpus so to sketch a few first methodological lines and establish a collaborative pioneer network. The publication of the conference proceedings should be a first cornerstone of this new consortium. As the history of several philosophical archives and their anchoring in history as such, we hope to shed some light on these places as knowledge sources and field training and to advocate for the inclusion of such materials for a new approach to the history and the exegesis of theory. 1 – Archives’ History/Histories. We welcome contributions dealing with the history of philosophical archives as institutions and how they became embedded in the cultural and social landscape of their time. On the other hand, the history of philosophy that can be reached through working on manuscripts shall be tackled. 2 – Conservation & Edition. The aim is to collect the testimonies of various specialists who have worked as curators and/or editors of philosophical manuscripts to better understand the specific challenges they may have met with each specific theoretical writing. Issues pertaining to the digitalization of theoretical funds and to the intelligibility of its objects will also be addressed. We welcome papers on paradigmatic cases that can also fit within the 3rd type of propositions below. 3 – Editions & Exegesis: approaches and methodologies. Several contributions and a round table should open common methodological perspectives from the observation of several philosophical corpus. We aim at sketching a guideline applied to philosophical manuscripts, whether from the point of view of interpretation or of publishing. 4 – The Archives of Theory. This last panel aims at collecting propositions dealing with theoretical corpus outside philosophy, sic as literary theory, art history, science history, semiotics… This comparative perspective should bring up the specificities of this type of documents in their relation to the philosophical materials.